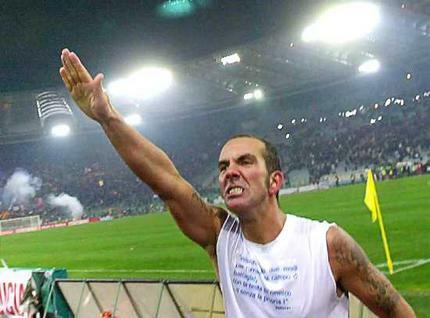 Paolo Di Canio is a notorious nut case and fascist but let's forget about that. Some Swindon fans have been having a go at him, they are braver than I. Most people thought di Canio was going to be a disaster. Certainly things didn't get off to the best start, losing his first three games in charge and falling out with one of his players. Things have changed dramatically since then and Swindon now find themselves at the top of League 2. However they were beaten 2-0 by Crewe at the weekend, which led some fans to criticise Paolo. Not a smart move. "I'm not worried about this because I am too strong, too good, too intelligent, but I want to say to the others 'don't follow the stupid'. Ninety-five per cent of fans are amazing because they love this club, but there are a small number of fans who criticise in a silly, pathetic way. " It wouldn't surprise me if one day, Paolo actually jumps into the crowd and has a fist-fight with a fan. He is the embodiment of the passionate Italian stereotype. My love of di Canio really tortures me. He was a brilliant player, he is extremely entertaining with everything he does but the fact is, his political beliefs are iffy at best. Why do you have to be a fascist Paolo? I want to love you but then I would hate myself. Obviously his salute pictured above, offended lots of people. Paolo has always maintained that he is not racist but is a big admirer of Mussolini........I'm all racismd out for today so I'll just leave that sentence as it is. Perhaps I'll read his book and see how he really feels? Or I'll just skim read articles on the internet and pretend I know what I'm talking about. That sounds way easier.